The Model Trains layout set-up was the only dream of me from my child hood so I started making some Indian Railway Battery Train Running Models in my school projects which were very hit and selected by School & Government authorities to display in there exhibitions . I was also a electronic/technical bug from my childhood. So one day my friend came to me and shown his defective model train engine which his dad had bought for him from USA. I was quite surprised to see that first in my life time (At that I had just completed my 12th class). I repaired that loco for him. And thought which day I can get that one for me and setup my miniature Railroad In India at my home. This became my dream and was fulfilled when i imported a set from USA after spending my credit card limits after 10 years. I was too happy and made a miniature Model Railroad at my home. The dream was not stopped there infect it got bigger to make people aware that Model Trains are not Just Toys they are the replica of real ones. They comes in Different size like N 1:150, 150 times smaller than the real one, HO 1:87, 87 times smaller than the real one , G scale 1:23, 23 times smaller than the real one, normally called as Garden Railways which people use in abroad in gardens , Shelf top layouts and to carry the food items and many more scale comes such as O , On30 etc. To make people aware I have started a first of its kind of Model Train Store in India On 17/01/2002 with 2 working dc/dcc Miniature layout of Ho scale and a shelf top layout of G scale with automatic running traffic and automatic day & night light changing modes as seen in Miniature Wunderland, Germany. 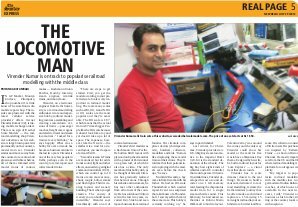 On 29/07/2012 The Indian express given me a Title of “Locomotive Man” and shared my views on its half page Sunday paper and Railbandhu Magazine which is provided by Indian Railways in Shatabdi & Rajdhani expresses to Its passengers given me a title of “STEAM BOY” and shared my views on 4 pages of its magazine. After that Decibel Scale Models has done a lot of projects with Corporate and individual world. But From more than last 4 year I was researching of Food carrying Trains and I was too much fascinated to see World’s First Vyotopna Train Restaurant in Prague, Czech Republic where drinks were served by the Model Trains. Now my next big dream was to make a First In India Train Restaurant not even to serve only the drinks but to serve food on The Model Trains. So the past last 4 years of my life was gone in making of a fully automatic hardware and software system on my own with no out sourcing and to operate a First of its kind Model Railway Train Restaurant In India In which the Food & Drinks are delivered by Model Trains. My Big Dream Set-up was done by us for Recipes Train Restaurant, Guwahati in 02/04/2018. On opening it came into News channels and became a hit in social media and TV channels First In India Train Restaurant . People are coming from all Indian states & as well as the neighboring countries to just have the fun to have food served by a Train. Due to rush of Train Lovers to see & feel the Trains its always filled with customers with an on a average waiting of 30-50 customers on weekdays and just double on weekends.